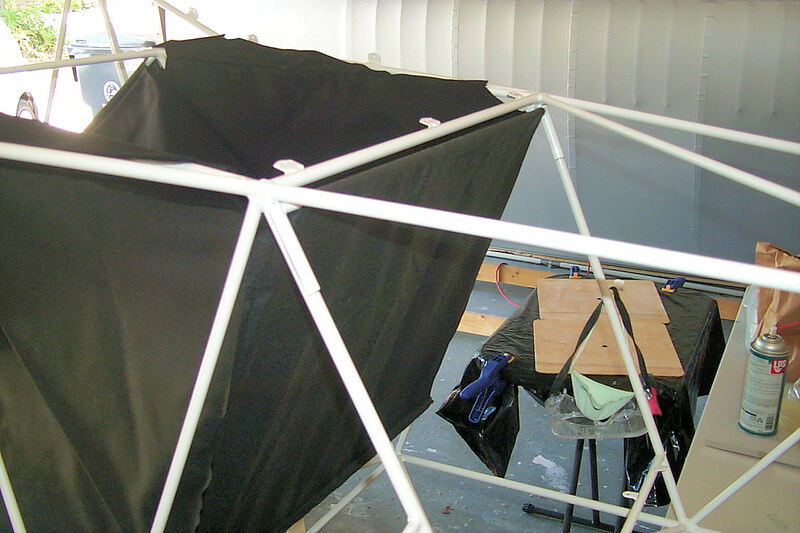 28 March 2012: I begin work on the covers. Most of my time is spent scratching my head. 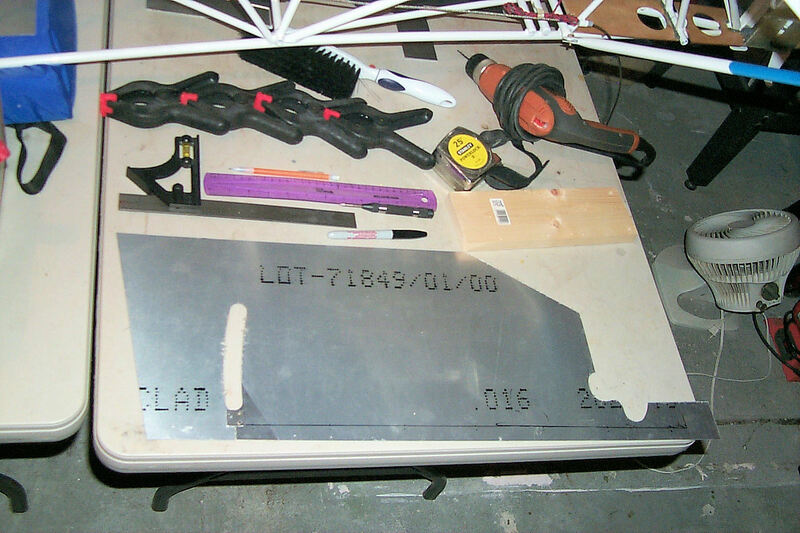 31 March 2012: After clamping the cover in position I trace a sharpie along the edge of the top mounting strip. 2 April 2012: One step at a time. 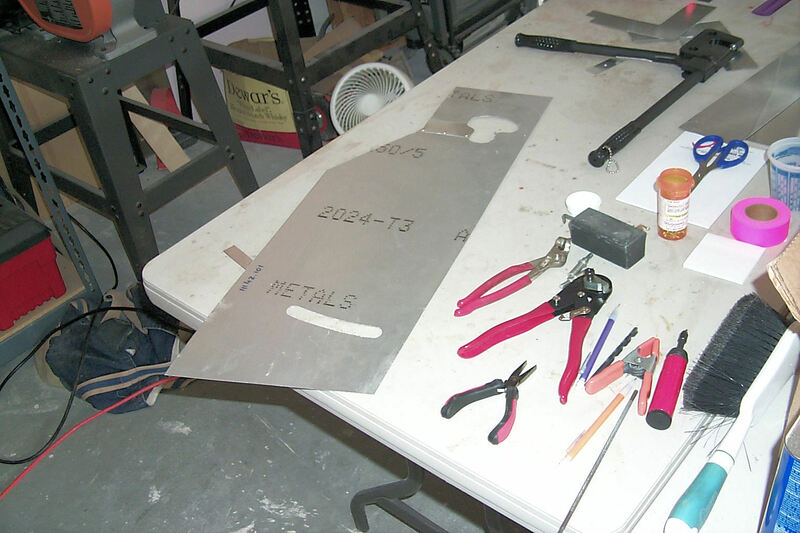 I first drill the holes in the cover using the traced line as a guide. (Each hole 3/16" outboard of the line.) Then I clamped the cover in place and drilled each hole followed by a cleco. The process required me to take the cover off and on about four times. 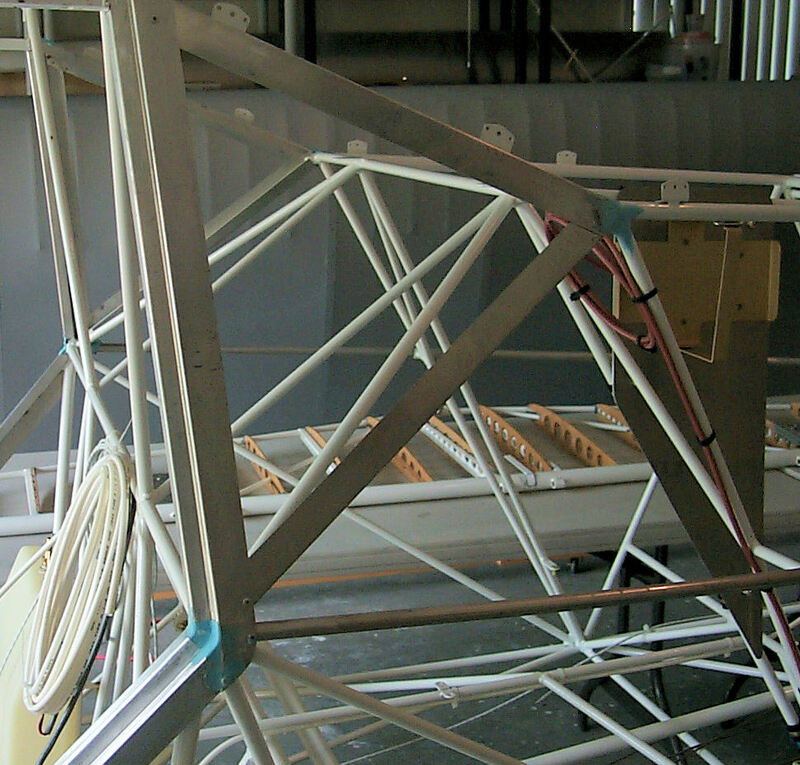 6 April 2012: The starboard access cover is in place. 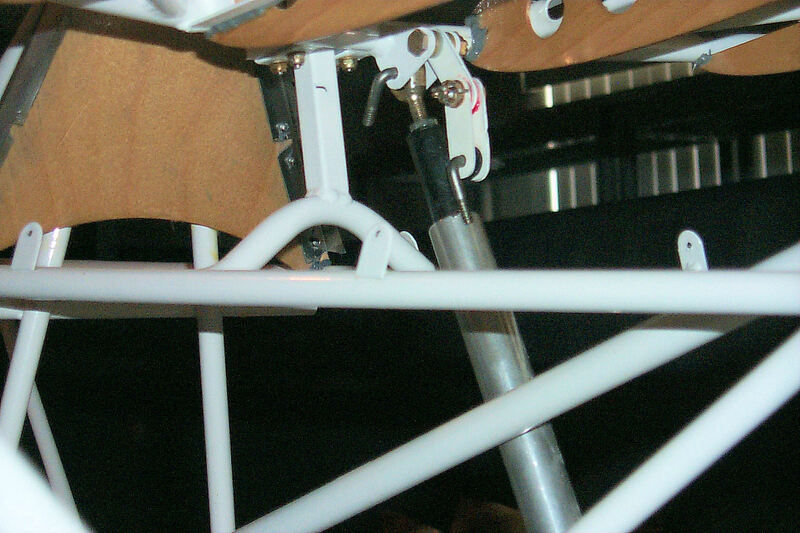 Adjusting the trim actuator arm. 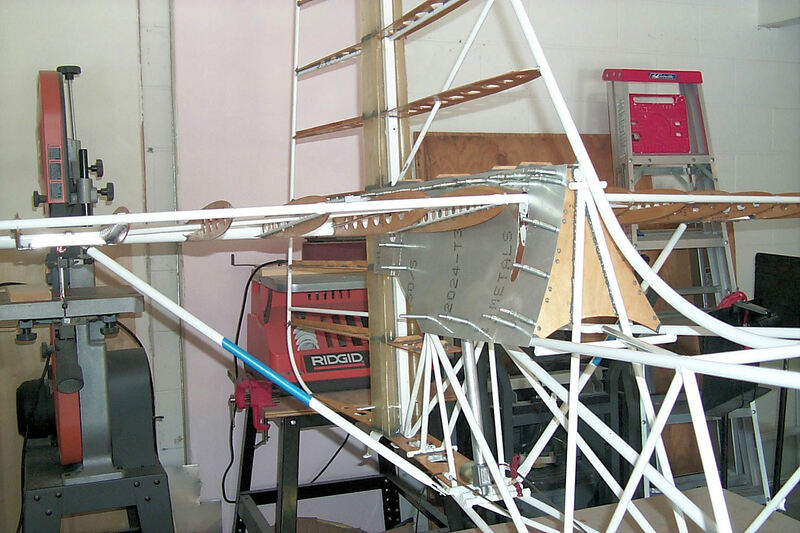 I've decided to do this before covering the fuselage since I'm also installing a trim position sensor. 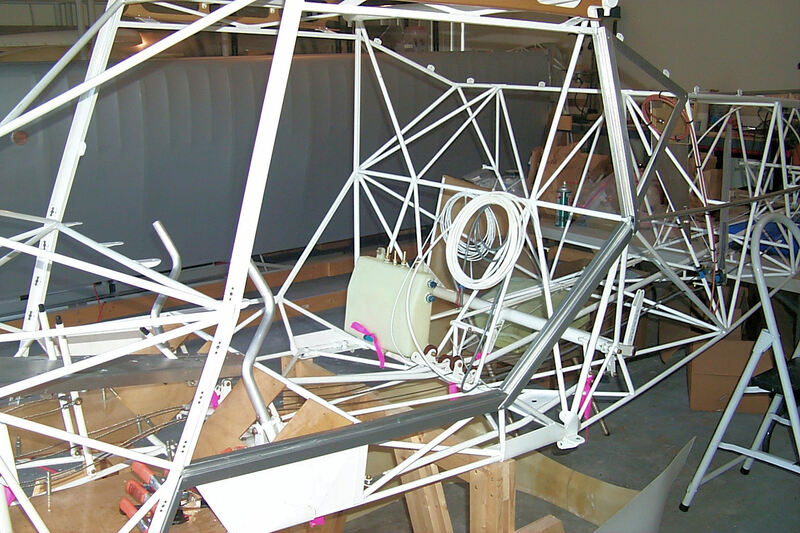 At final assembly I'll have to recheck my work. 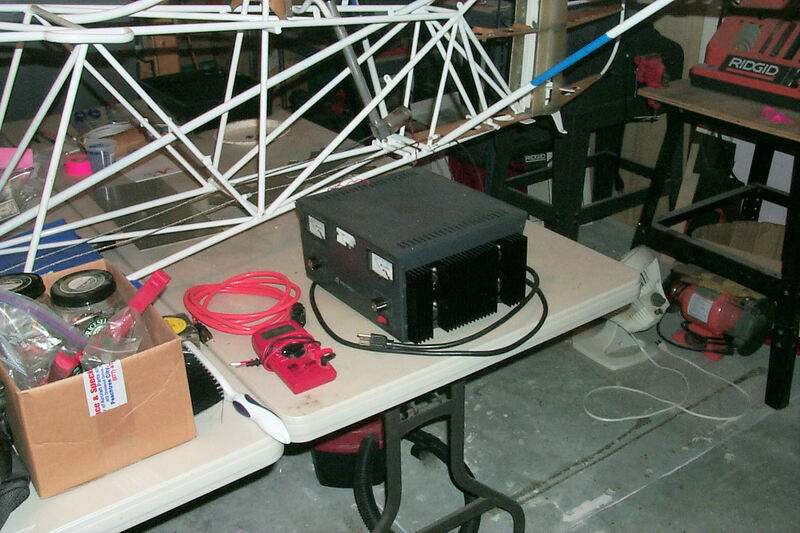 7 April 2012: So, I ask my rocket-scientist-avionics-genius friend about a power supply to calibrate the trim. He said, "Use one of mine. I have seven." 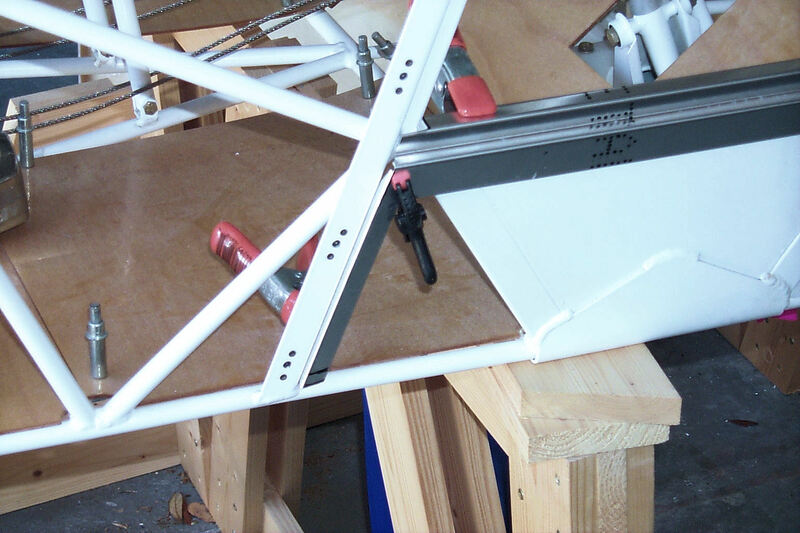 I adjusted the length of the trim arm and temporarily pinned it in place. 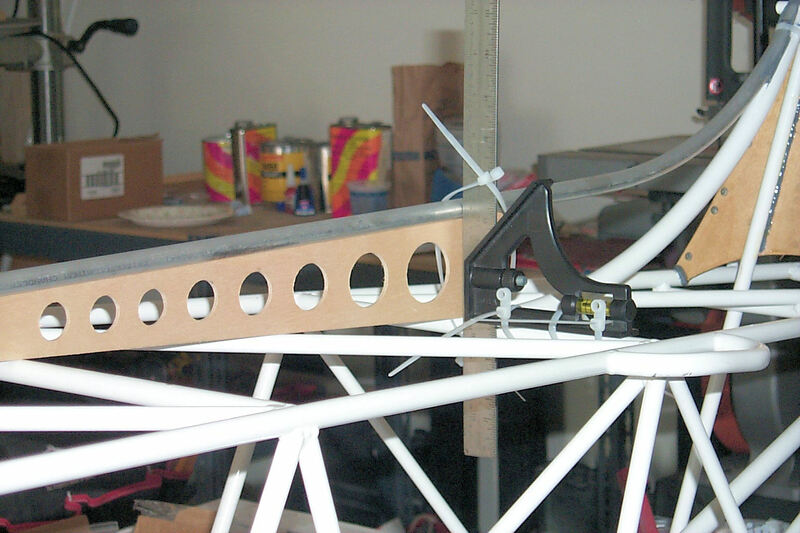 I also glued the trim sensor arm in place. 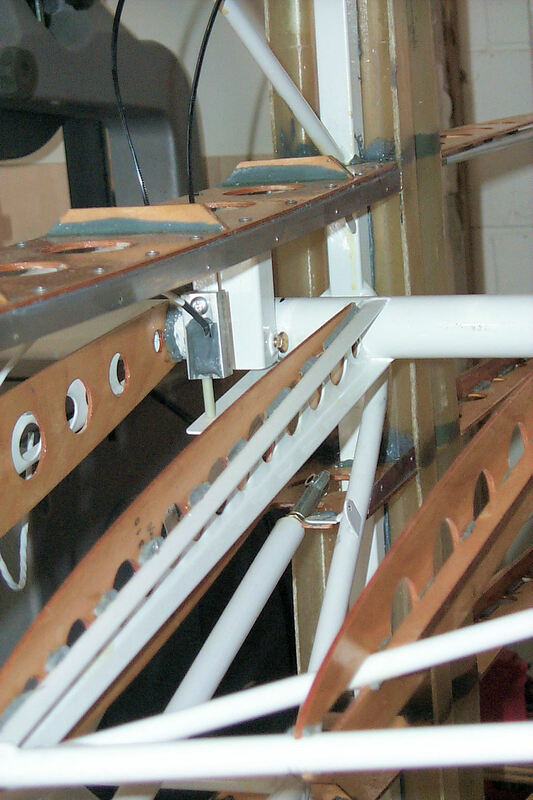 8 April 2012: The trim sensor is glued in place. 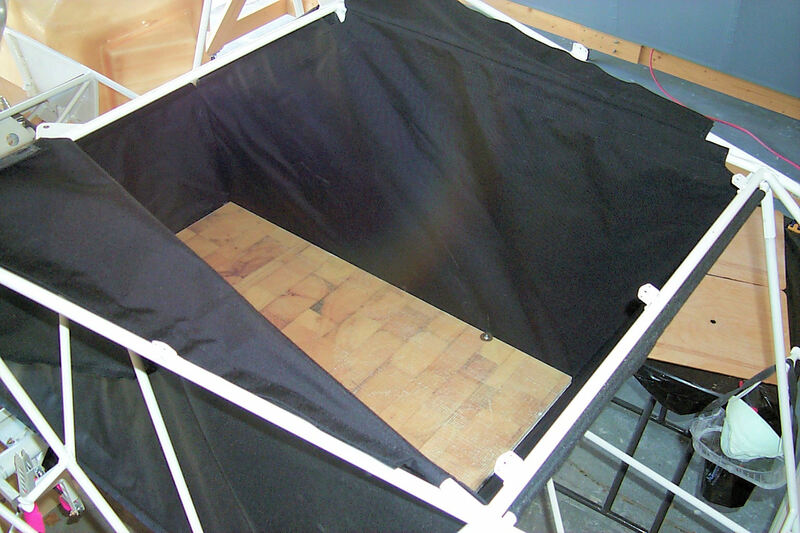 Cargo Bay: Years ago I supplemented my income by making boat canvas. 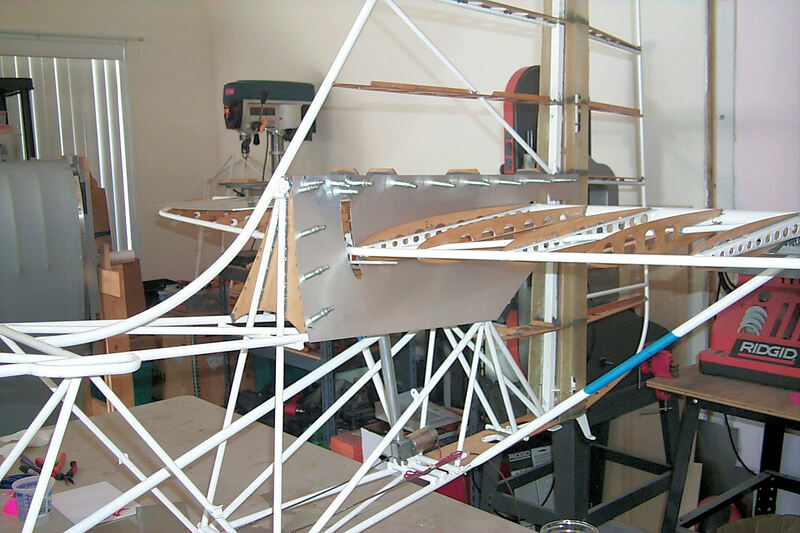 I was pretty good at it and developed enough knowledge to know that this piece of work is quite complex and unique. It would take me three or four attempts to come up with something adequate. 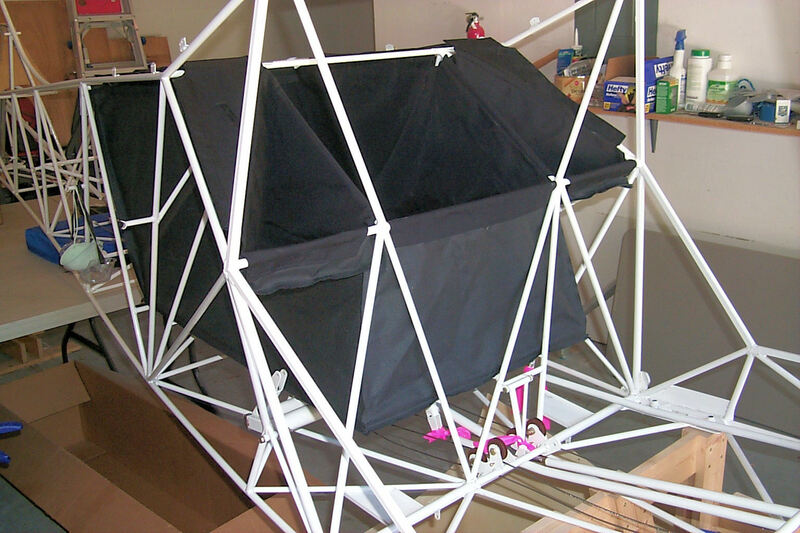 Instead of trying to make it myself I purchased the Cargo Bay from Kitfox. 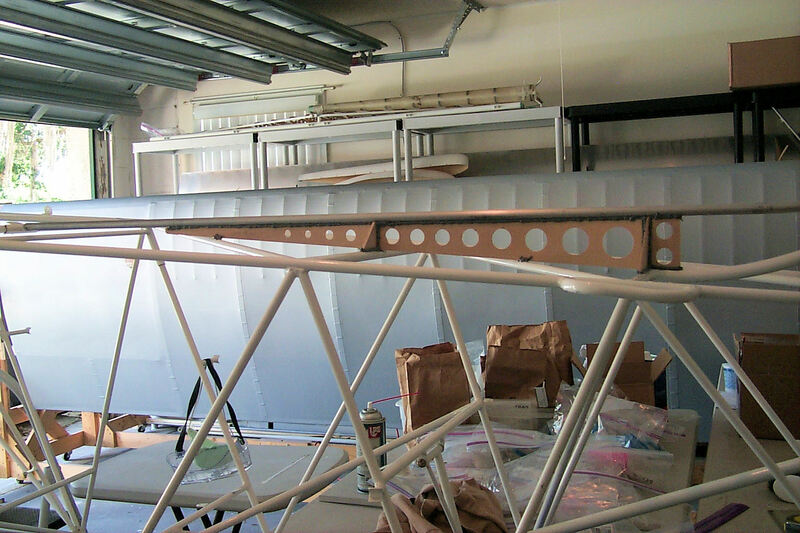 15 April 2012: Installing the Rear Cargo Bay Attach Tube. This took about 15 minutes after I spent the whole afternoon cleaning and rearranging the shop. 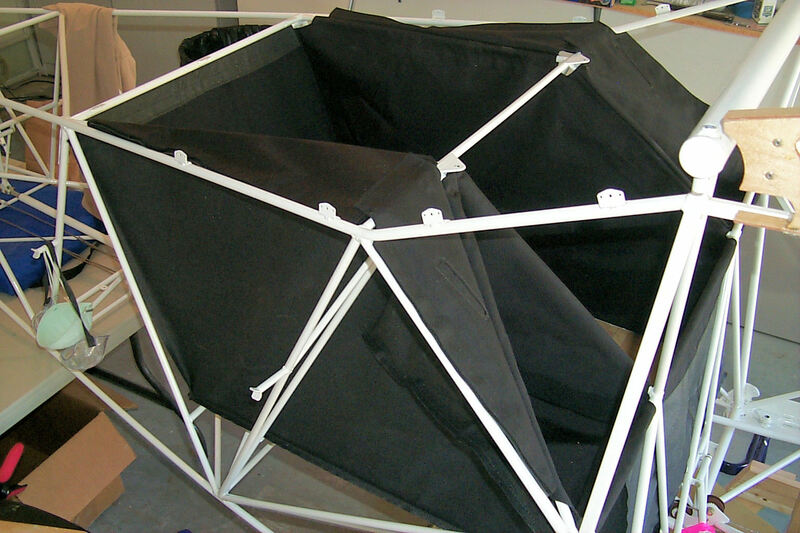 This tube supports the rear upper edge of the cargo sack. 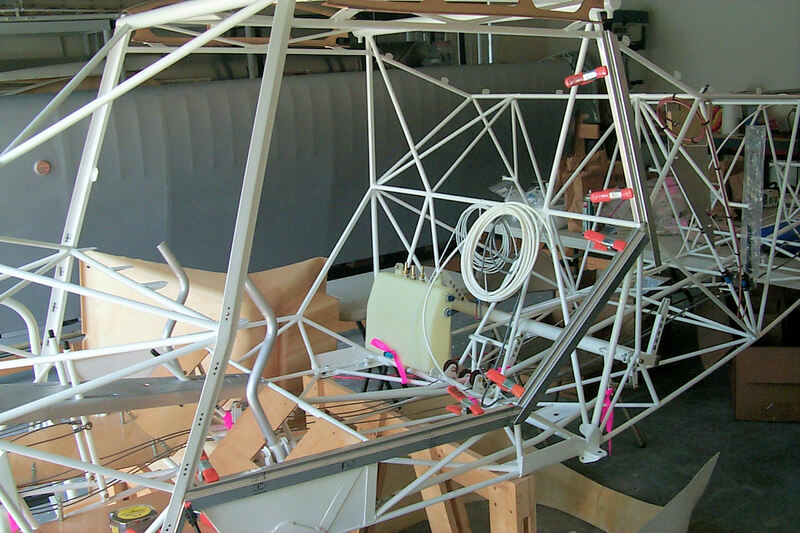 17 April 2012: Trial fitting of the Cargo Bay. 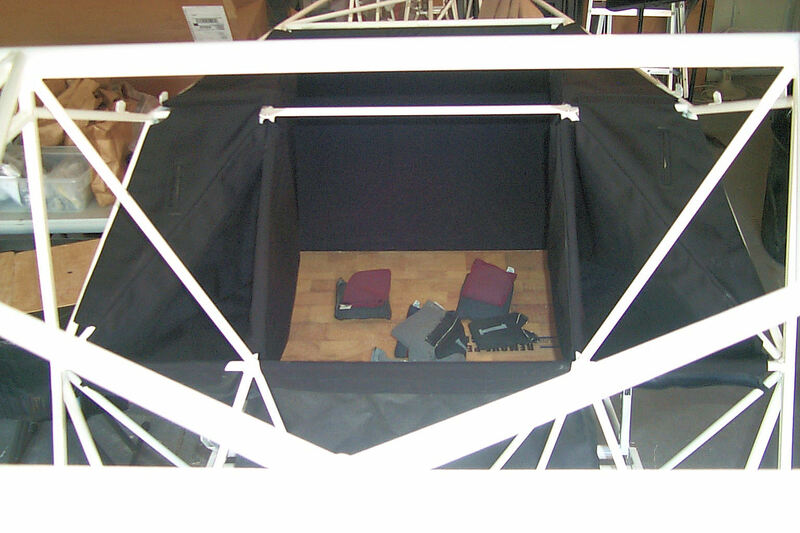 The second photo shows my scuba weights holding the floor in position. A difficult lighting situation for the camera. 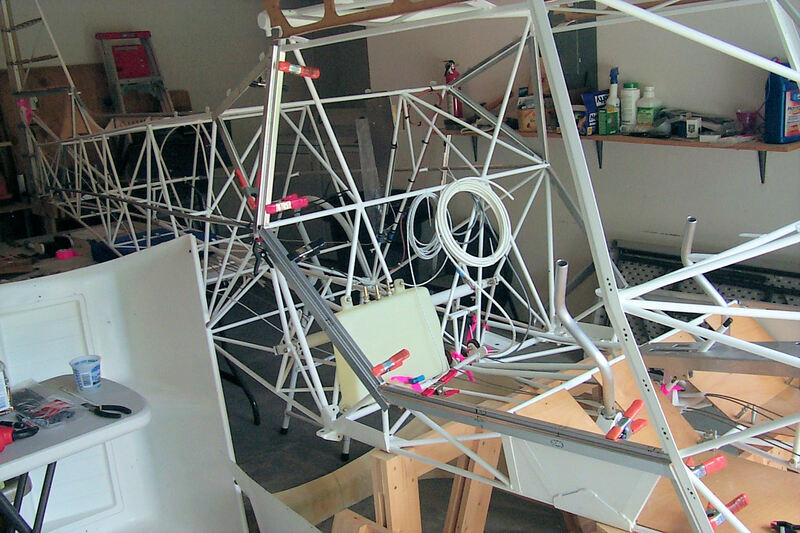 24 April 2012: I've had very little time for the kit over the last couple of days. 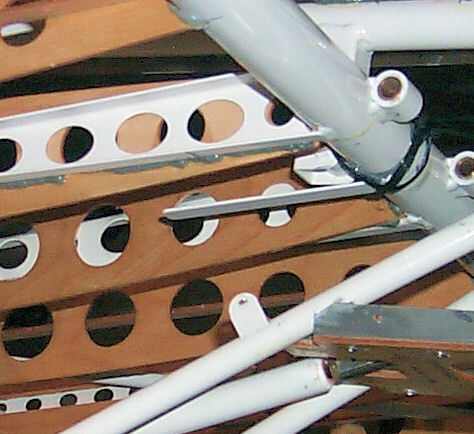 I did manage to drill the mounting holes for the floor of the Cargo Bay. I'll say again that I'm not a big fan of rivnuts but, sometimes they are the best solution. 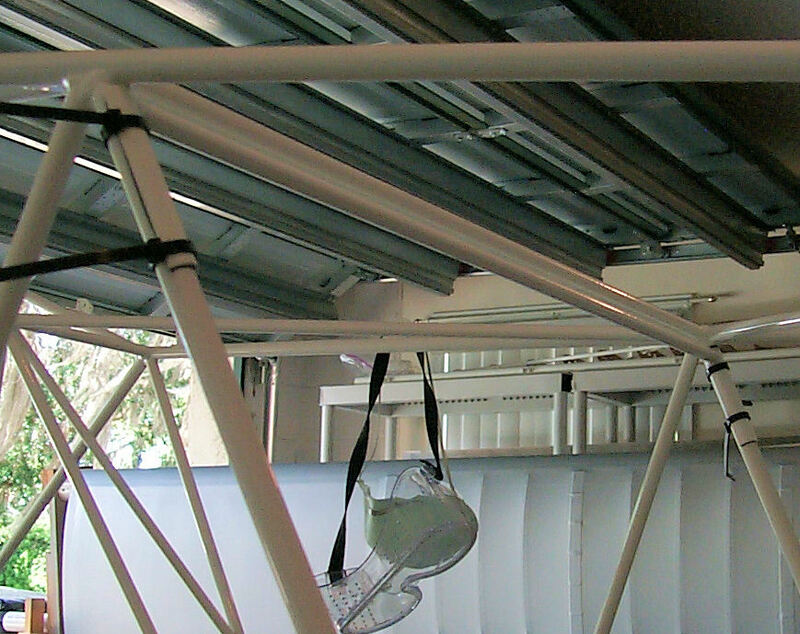 The finished Cargo Bay. 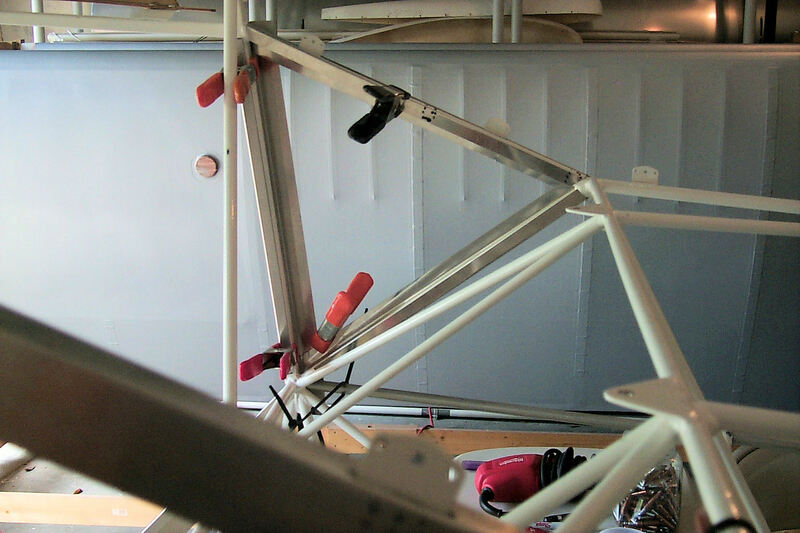 It will be removed and won't go back in until the airplane is finished. 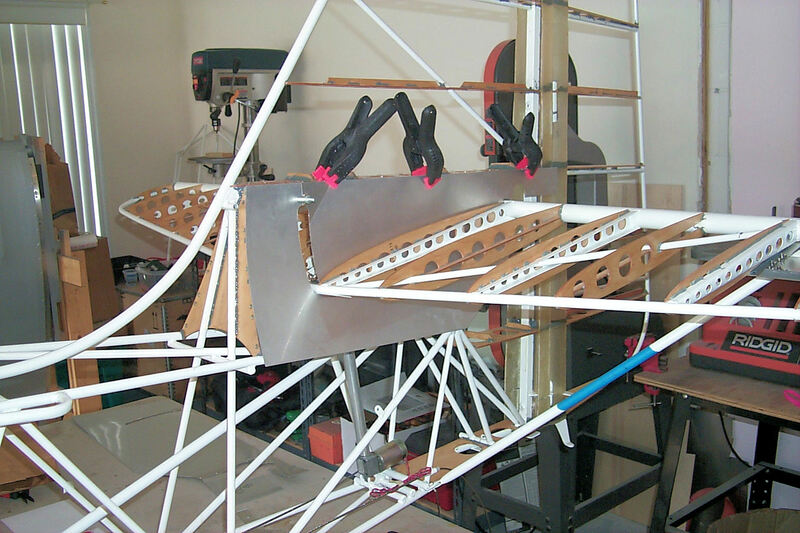 ELT Mounting: My inspiration for this mounting are some photos sent to me by Kitfox. 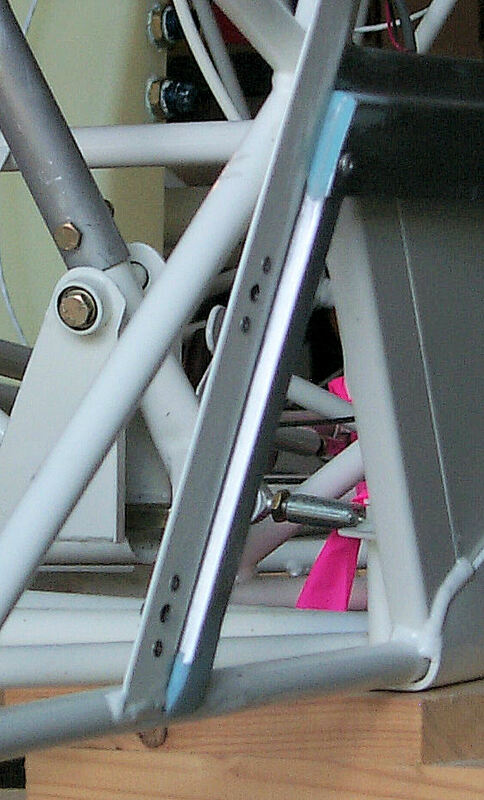 Their design featured two aluminum bars. 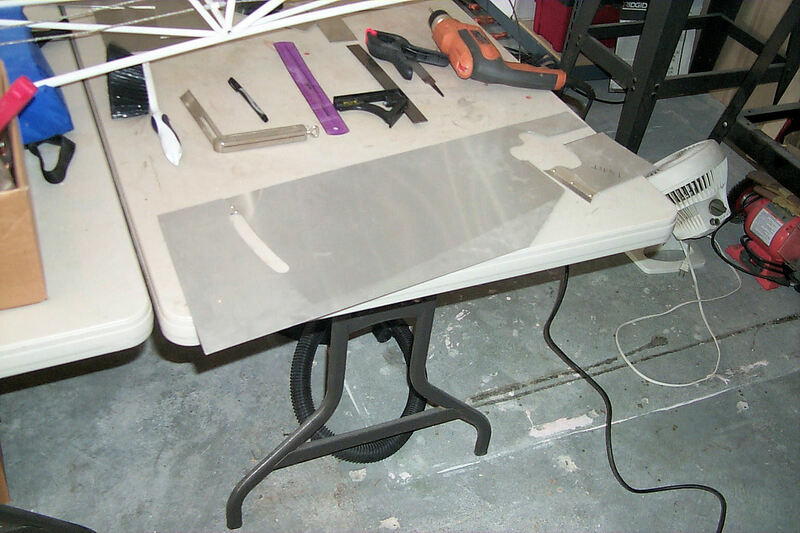 Since I had some stock .050 aluminum sheet left over from a project with the Cessna I decided to make my mounting out of a single sheet. 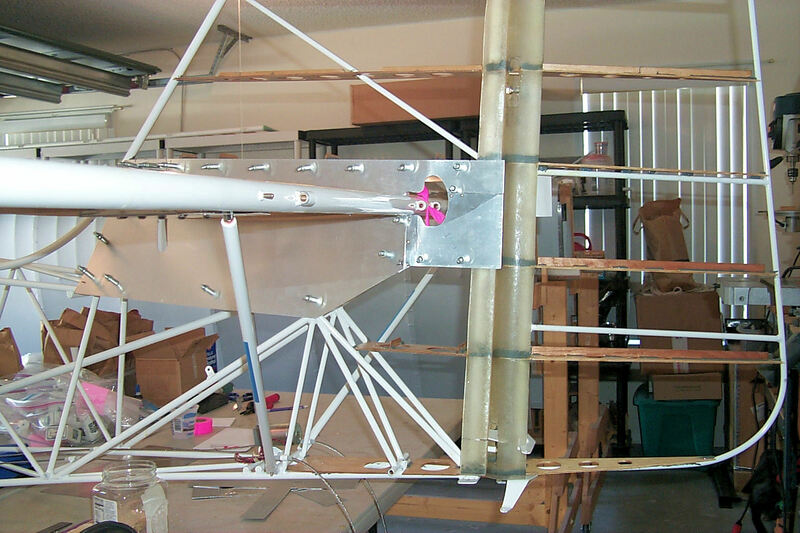 The advantage of having the ELT mounted high is that it's very accessible. 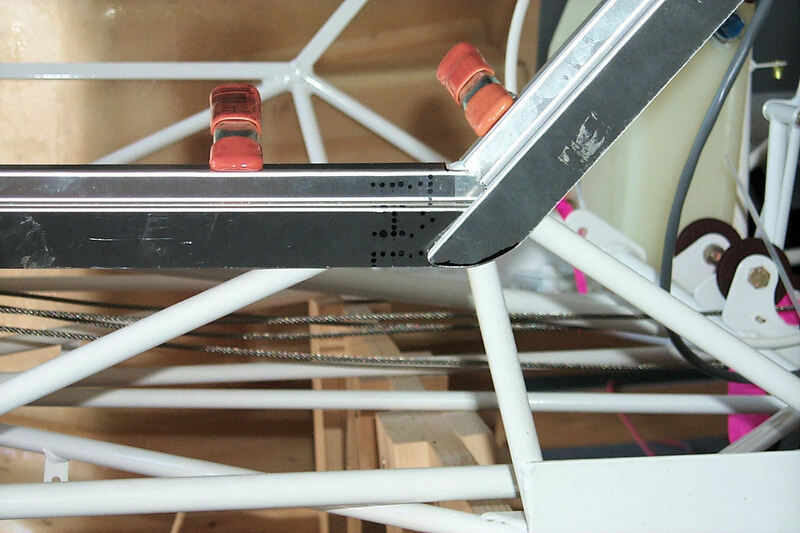 25 April 2012: I've drilled and clecoed the ELT bracket. 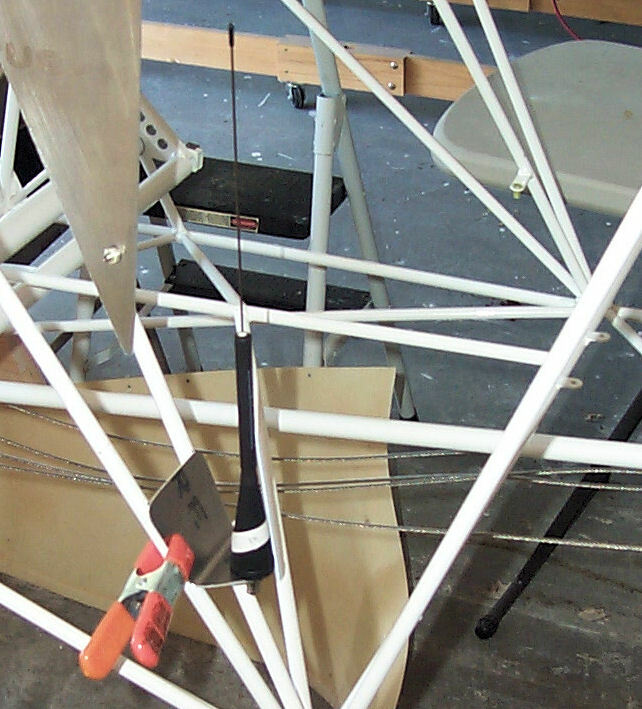 I then clamped the whole thing in place and, after adjusting it to an ideal position, I drew cut lines on the back. 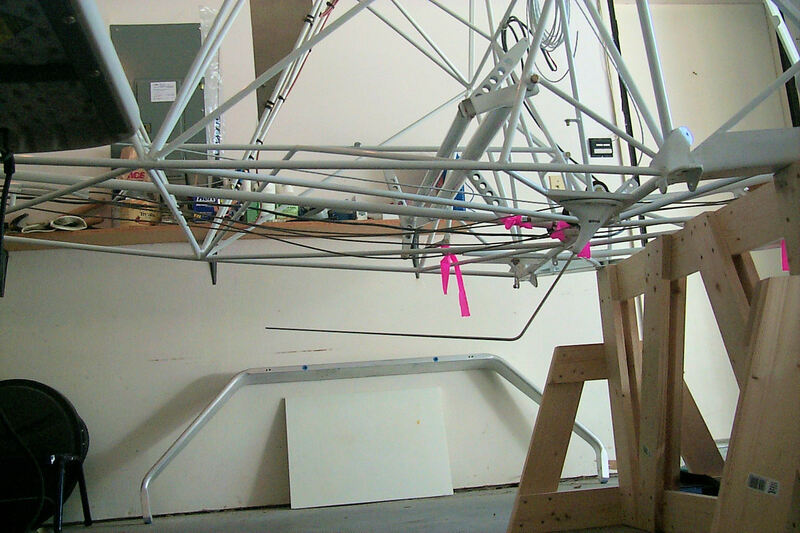 27 April 2012: Another makeshift bending fixture. 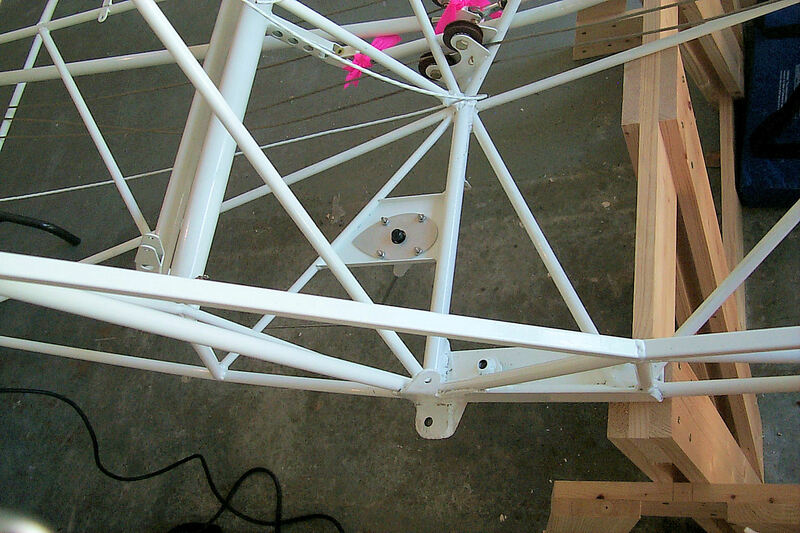 Making a bracket for the ELT antenna. 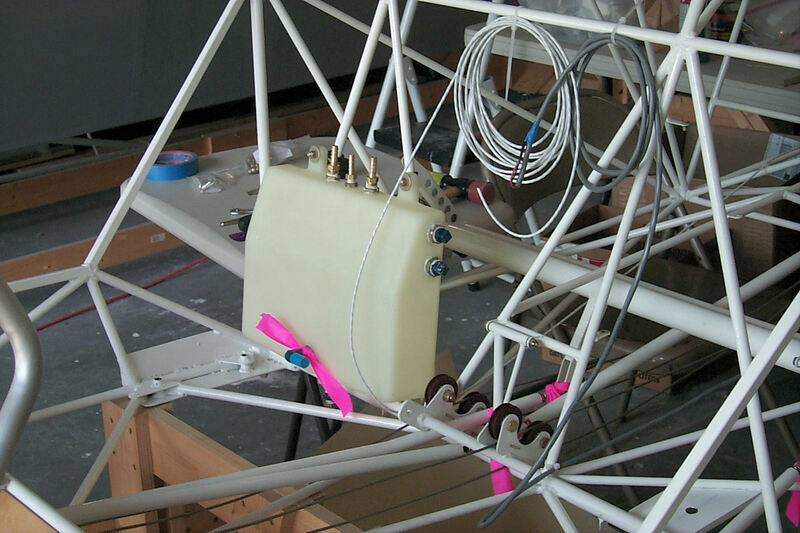 Many Kitfox builders mount their ELT antennas inside the fuselage in spite of an ongoing debate about whether this will inhibit the signal or not. Recently I read some reports of ELT’s with internal antennas being activated with little or no signal degradation. This convinced me that it’s okay to do it this way. Done! Well, almost. The ground wires still have to be attached. 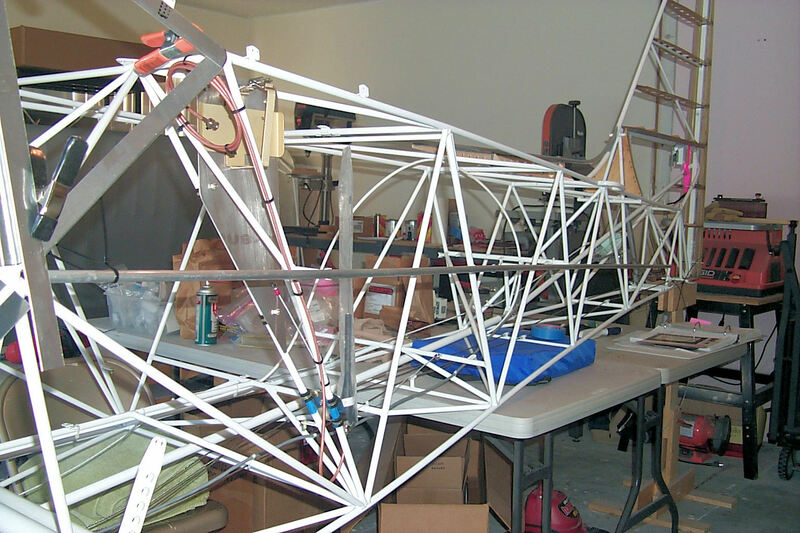 I will leave the antenna and the cable in place while I cover the fuselage. The ELT will be removed. I know! I'm using the more expensive zip ties. It's all I have and I don't want to drive to the hardware store. Another one of my makeshift jigs. 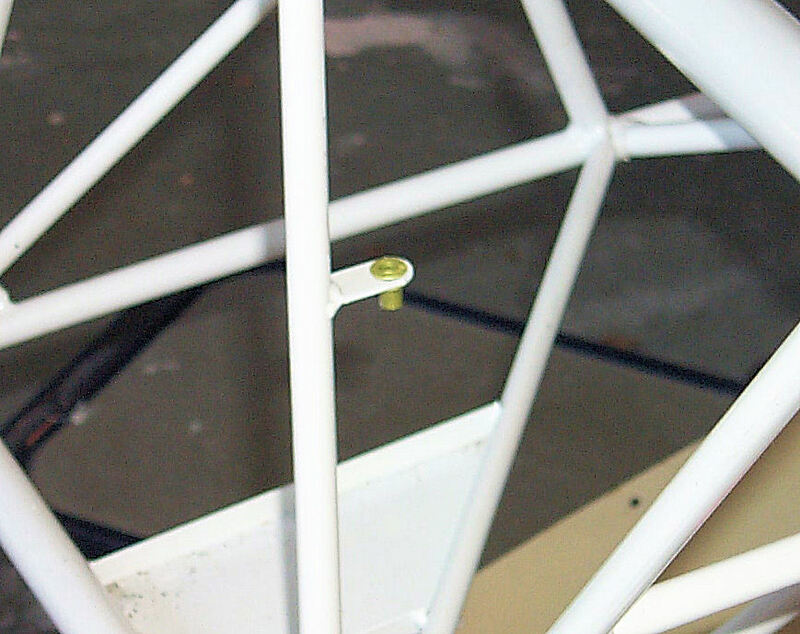 The fitting at the forward end of the razorback. 2 May 2012: In the first photo I've tacked the wood in place with super glue. 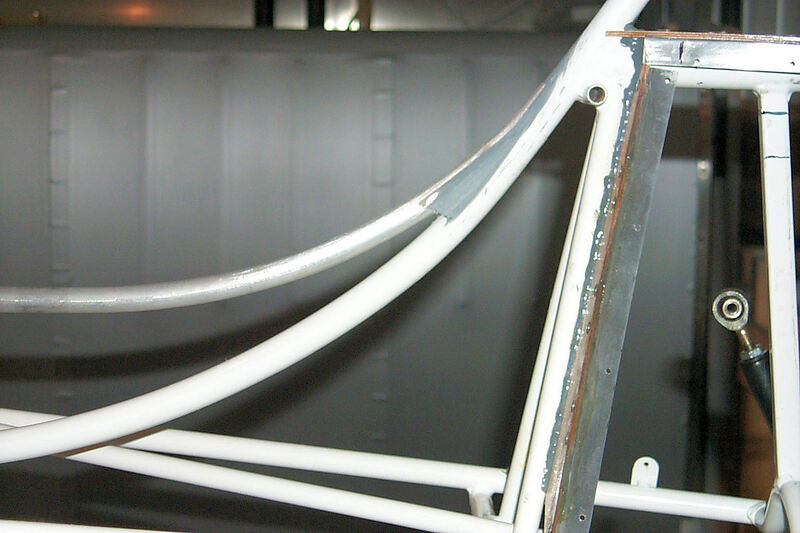 A few "spot welds." I took the second photo after I applied a bead of epoxy on every seam. The rest of the afternoon was spent running wire. 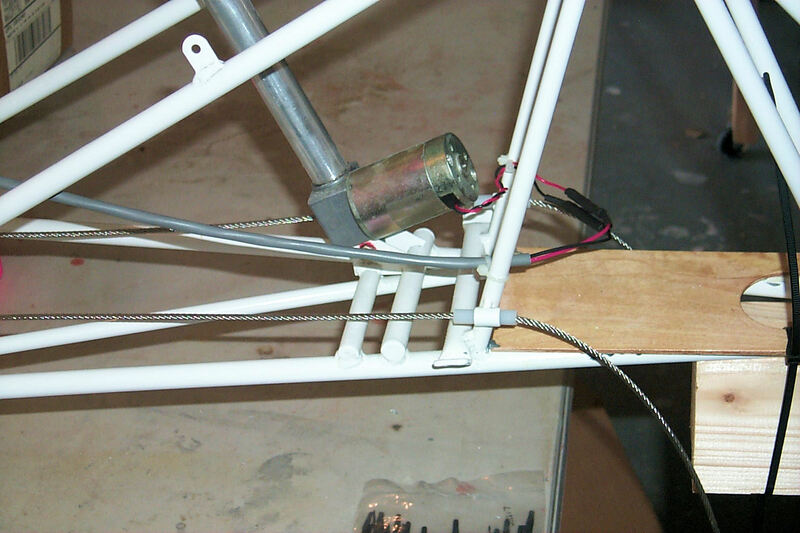 I grounded the ELT antenna bracket and spliced the cable for the trim motor. 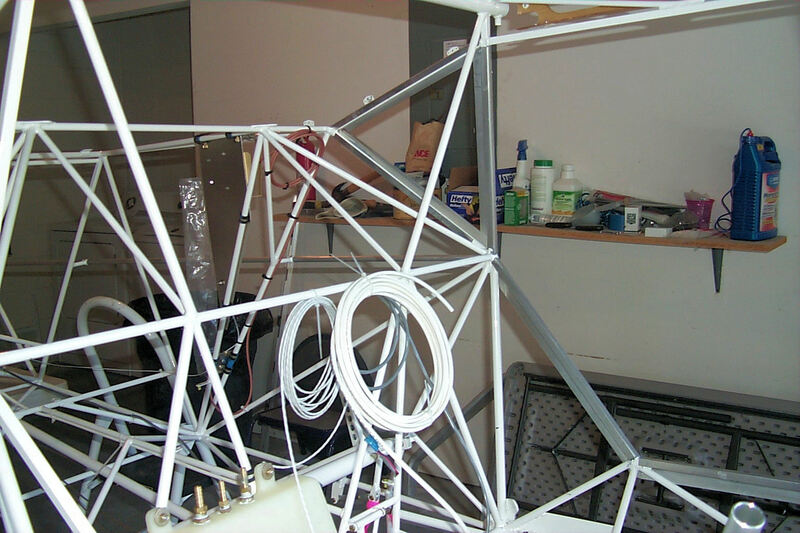 4 May 2012: I ran the cable for the trim sensor. 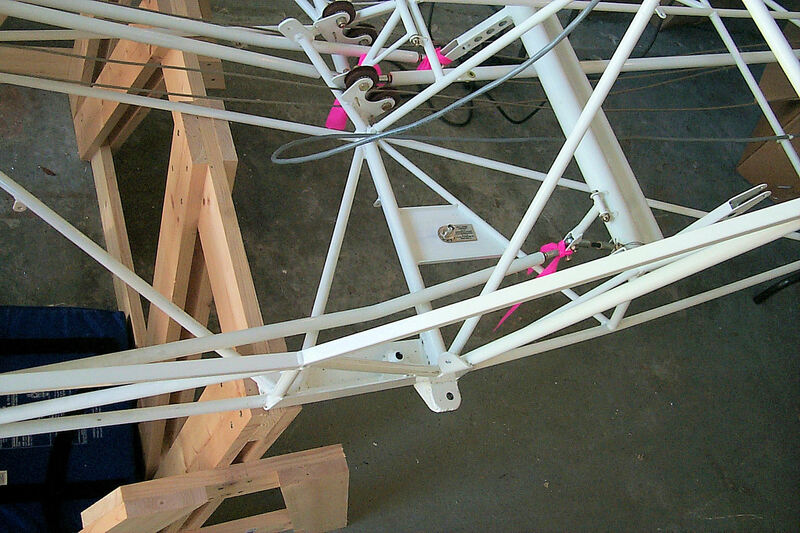 Trial fitting the comm and transponder antennas. 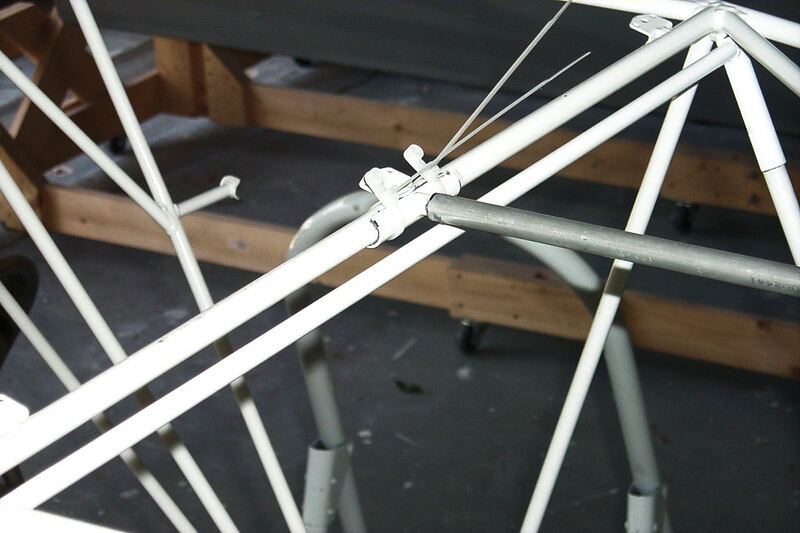 6 May 2012: I spotted and drilled the mounting holes for the antennas. 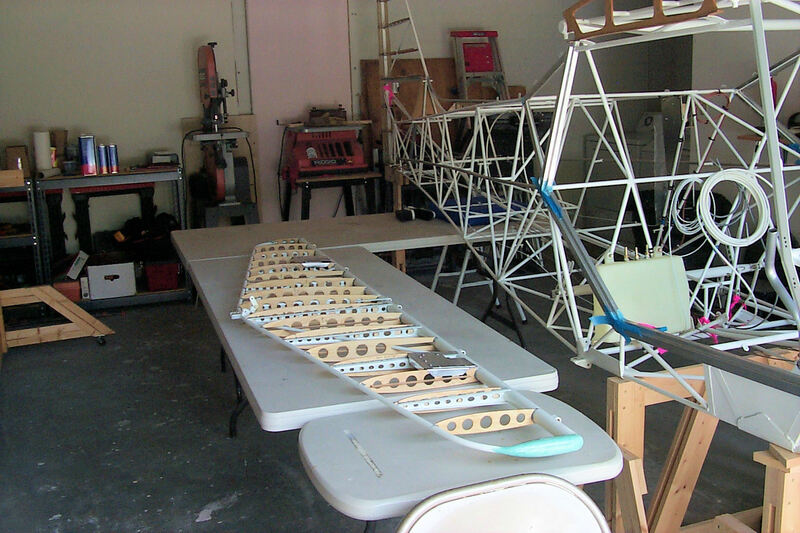 After covering and painting the fuselage I'll mount them permanently. 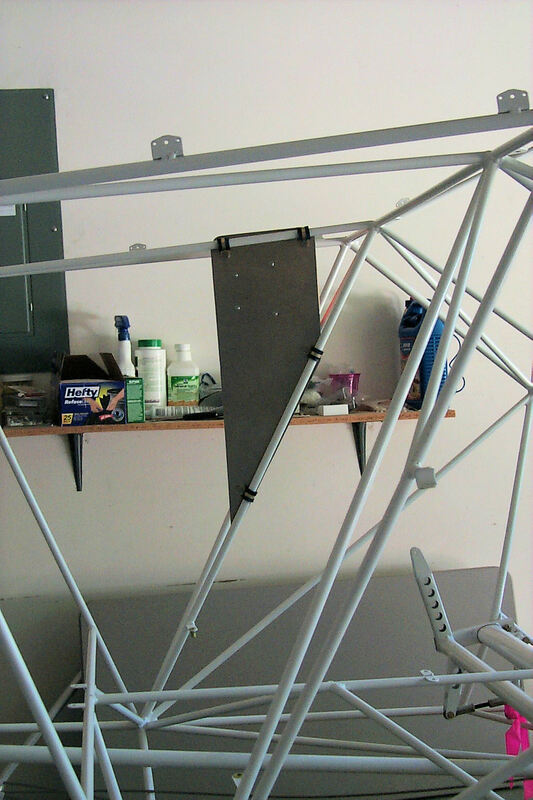 I'll have to sand away some of the powder coating to ensure an adequate ground. I've mounted the header tank. 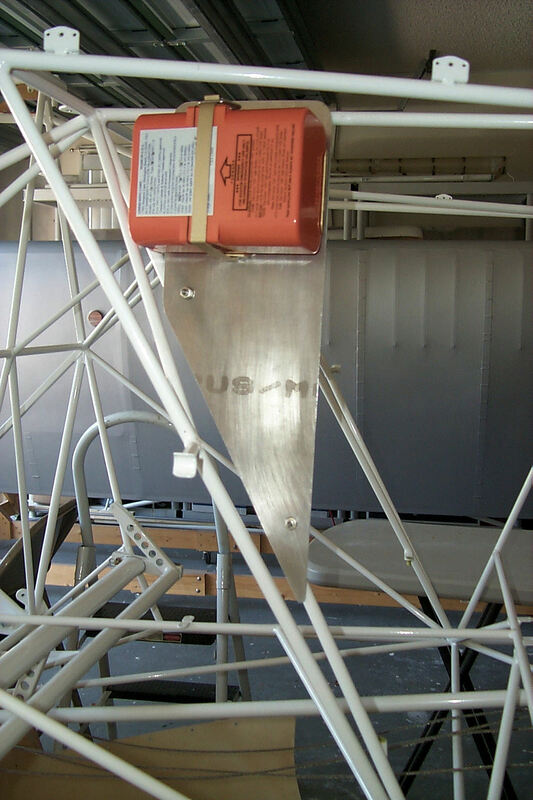 This has to be in position while covering the fuselage in order to position the sump drain access. 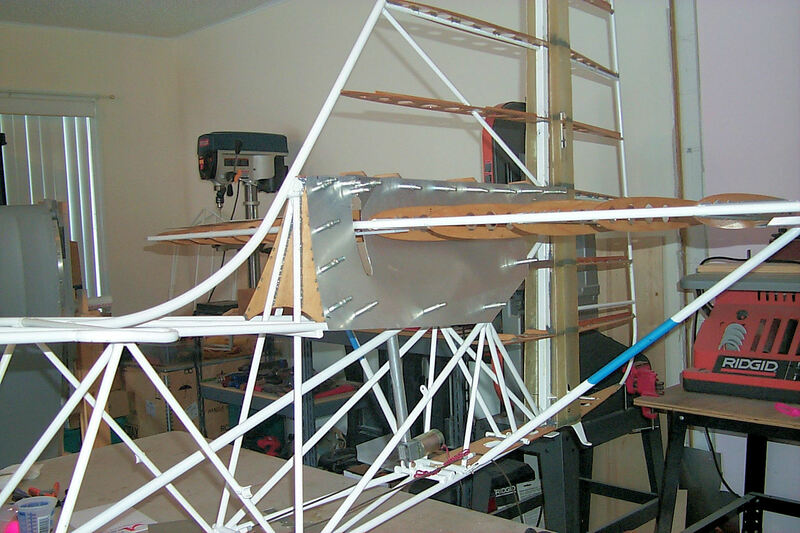 8 May 2012: I've faired the razorback to the leading edge of the vertical stabilizer. 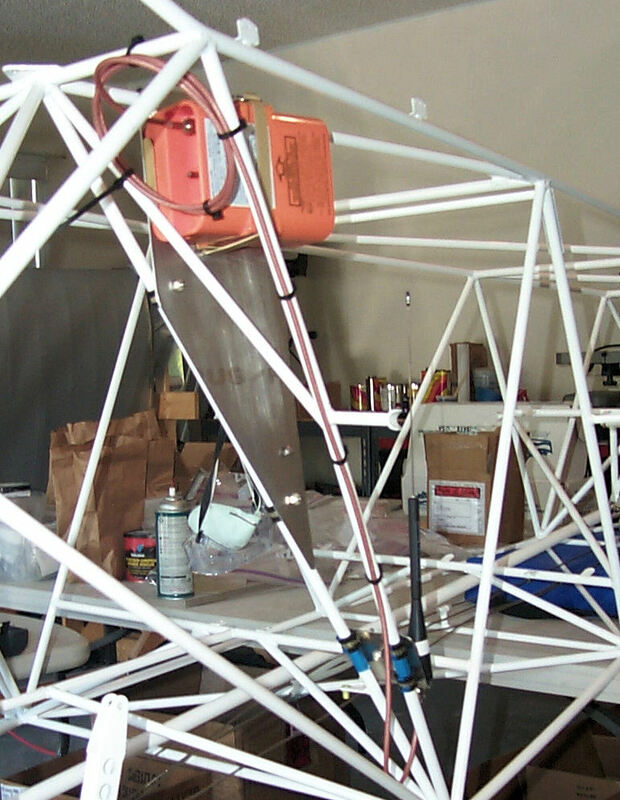 Fairing with Hysol requires more labor and doesn't feather as nice as Super-Fill. 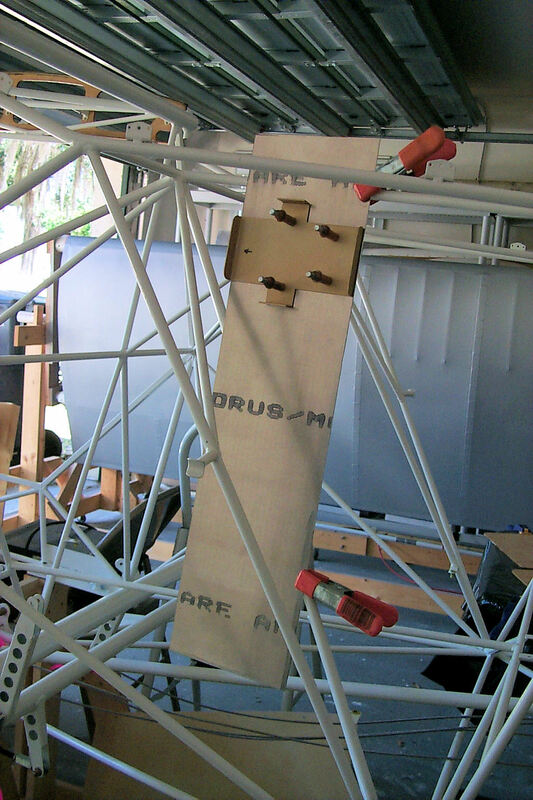 Since the Hysol's primary function is to adhere the two parts, fairing was secondary. 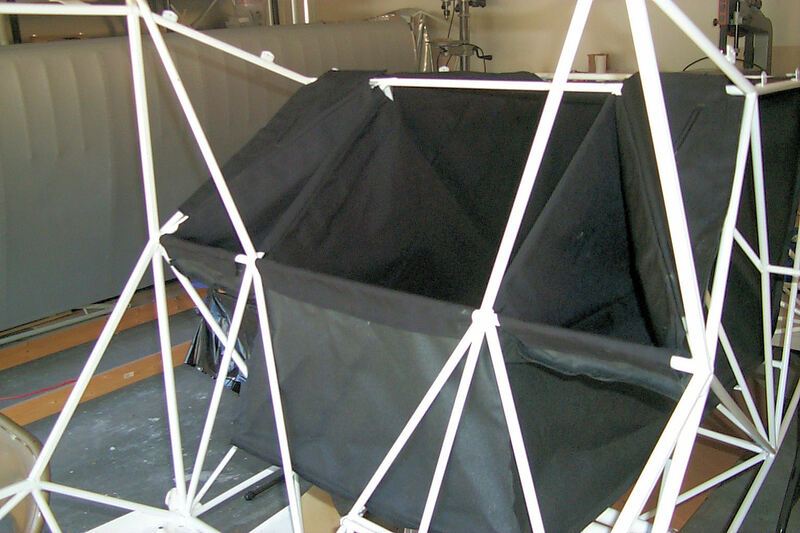 any roughness will smooth when covered with fabric. 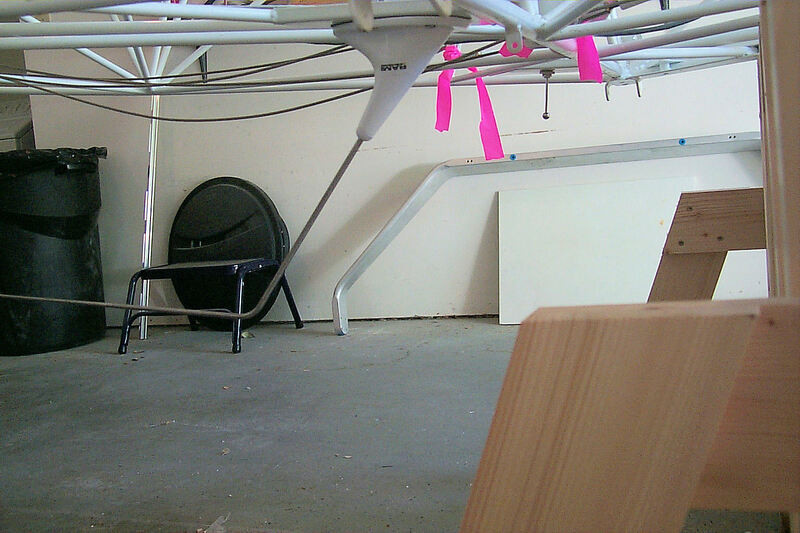 Door Angles and Side Stringers, 21 May 2012: The past couple of weeks have been filled with activity. 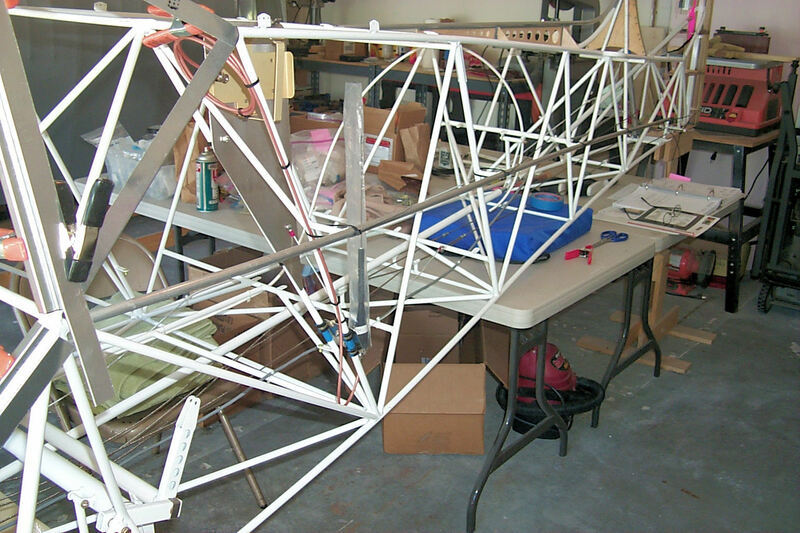 Porches to be re-screened, rehearsals and concerts, and a very old Cessna in need of maintenance. In the cracks I was able to do some work on the kit. 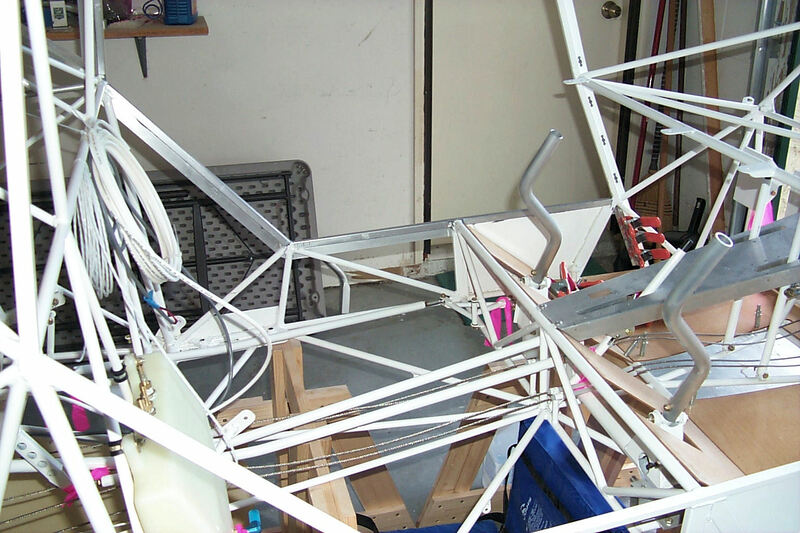 I've been told by a few Kitfox builders that the door angles gave them fits. With that in mind I'm approaching this task with great caution. I've discovered that my kit features a new version of the door angles. These wrap completely around the door frame. Since it's a little different from the manual I was somewhat on my own at figuring how to install them. In the end it was easier than I anticipated. One of the pieces was a little short. You can see a gap in the back corner. There's just enough overlap for a rivet. A bit of Super-Fil will fill in the rest. Framing for the "quarter" window. Before gluing the door angles in place I mounted the side stringer. 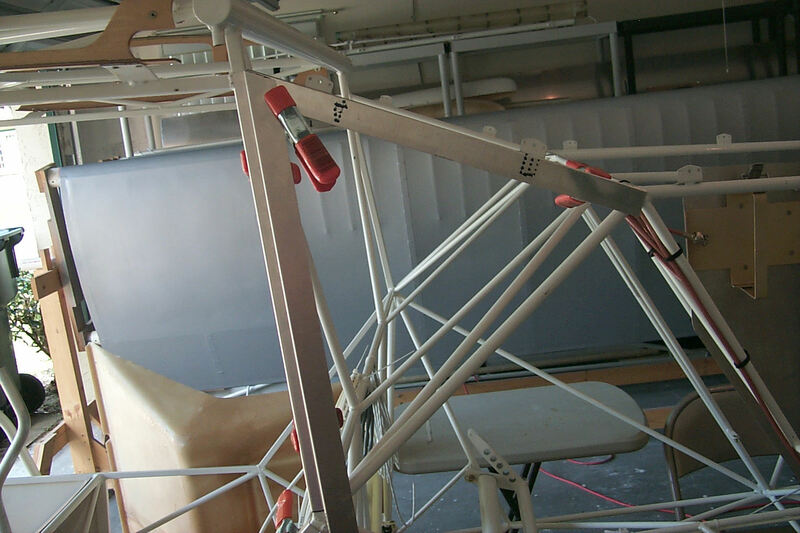 24 May 2012: The port side door angles are glued in place. 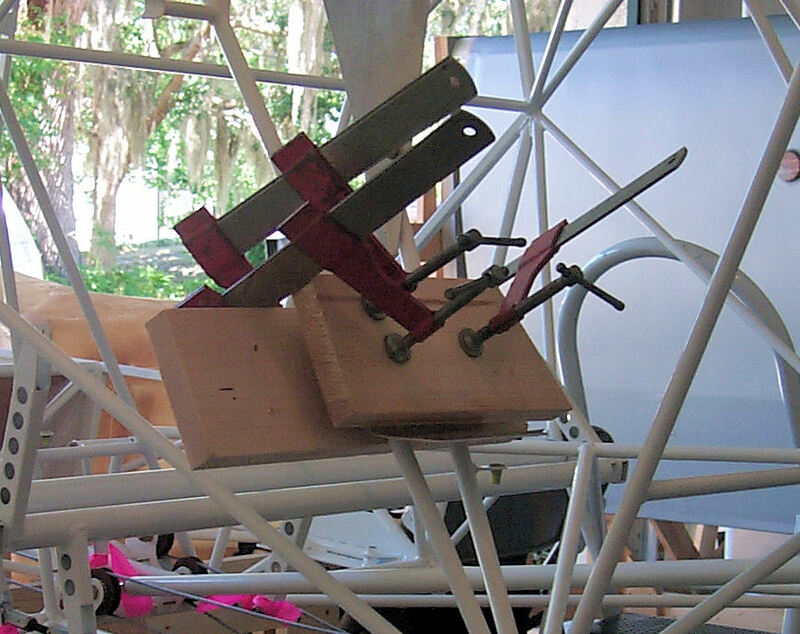 If you look at the forward corner you'll see clamps holding the last bit of gluing. I've dry fitted the door angles for the starboard side. 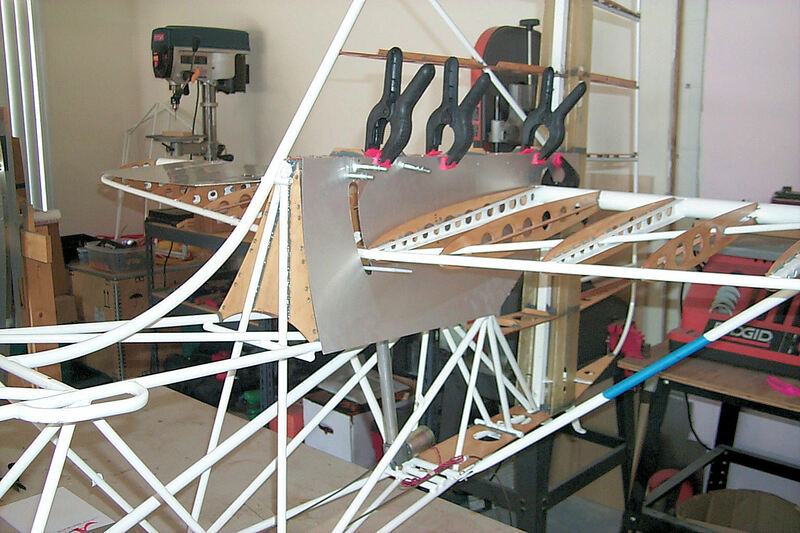 I also glued and riveted the stringer. 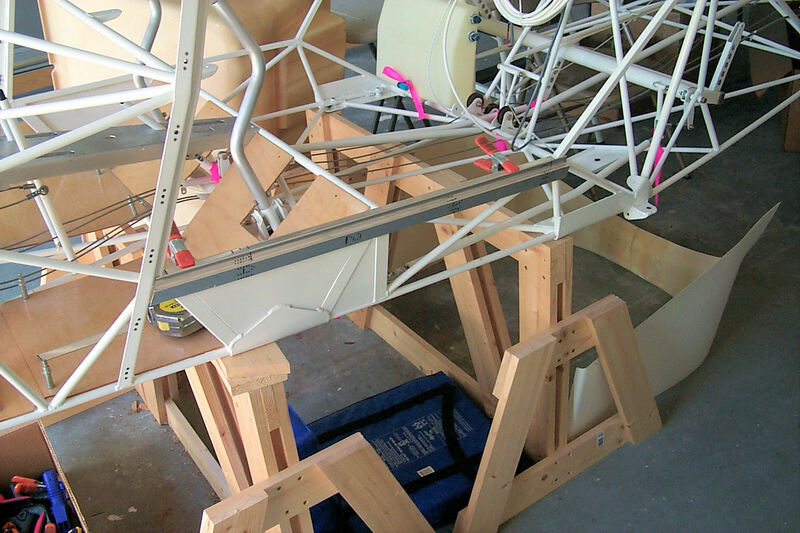 25-26 May 2012: The starboard door angles have been glued. I've filled the gaps with Super-Fil. 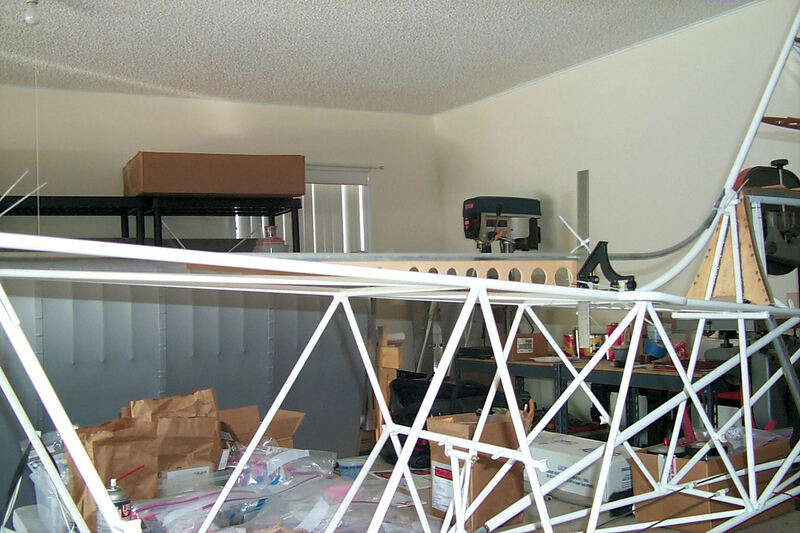 The masking tape is an attempt to keep the Super-Fil from sagging. The shop has been cleaned and re-arranged. 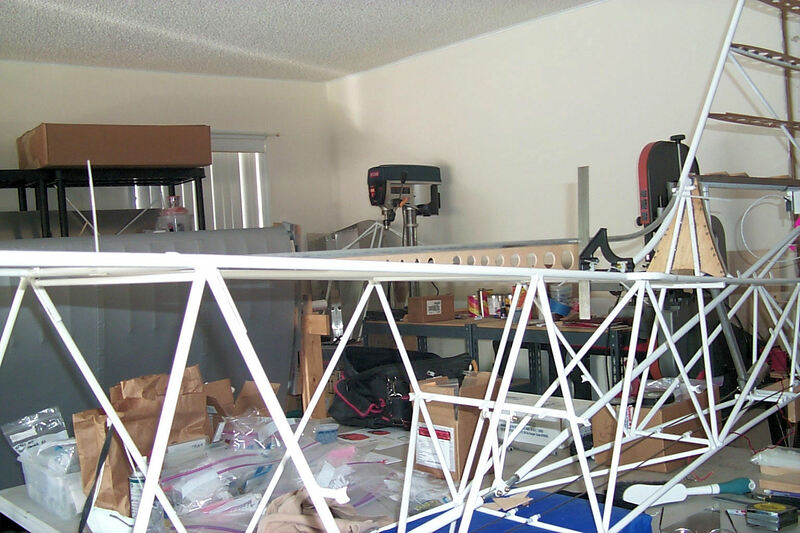 I'm beginning the process of cleaning and fairing the fuselage and tail feathers for covering. 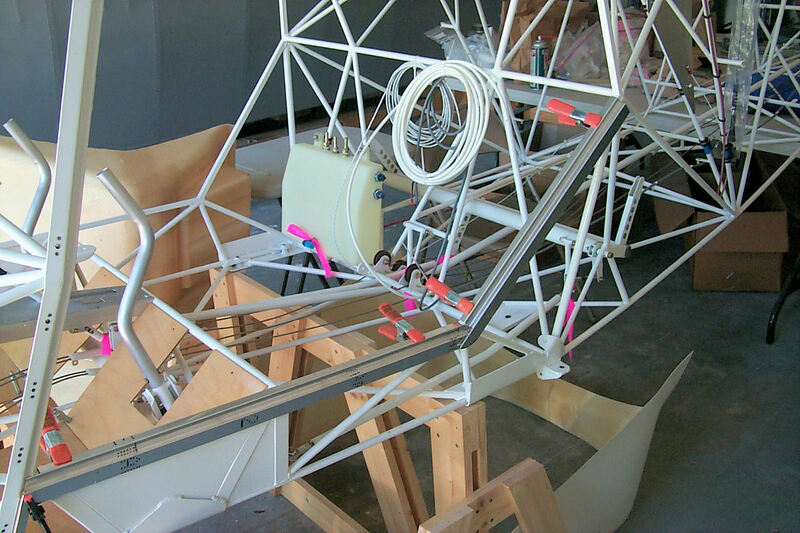 30 May 2012: I begin sanding the Super-Fil. 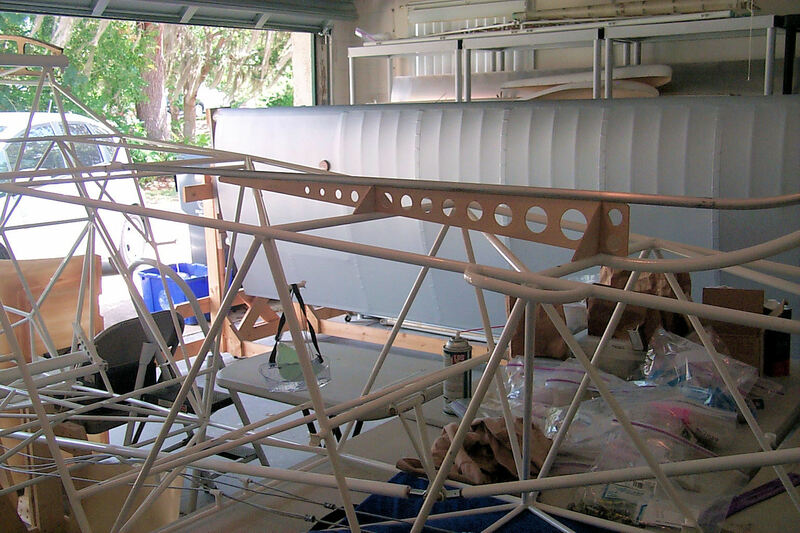 2 June 2012: Filling and sanding is complete.